I like to be ordered and systematic wherever I can, from evacuating a plane to going around the supermarket. This systematic approach also applies to the garden. We are clearing and restoring sections of it at a time in a neat and orderly manner. One border is completed before the next one is started, existing areas are tended-to before new areas are added. Maintenance is done before new jobs are started. Nowhere is this more visually striking than at the boundary line. The cultivated garden sits within the entire garden and the boundary line is where the two meet. It is not the physical boundary of our plot of land, but is where the “civilised” garden ends and the untamed, unrestored area begins. It is where the ideas-made-real meet, well, just ideas. It is where borders meet grassy expanse, flowers meet blank canvas, man meets nature, east meets west. 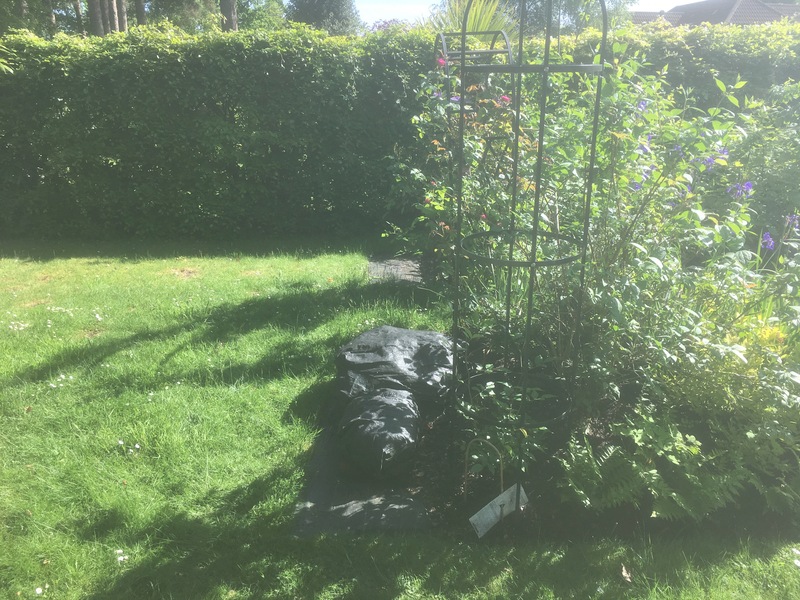 It is rather unceremoniously marked out by strips of black polythene used to cover and kill the grass before it is turned into border. This two-foot wide strip is the no-mans land where there is no border planting but also no grass. The boundary line sits at the half-way point down the garden. To the right are sixteen metres of verdant, bursting borders, brimming with plants and flowers. To the left are sixteen meters of grassy expanse, some wilder scrub areas and discard piles, untamed by lawn edger. 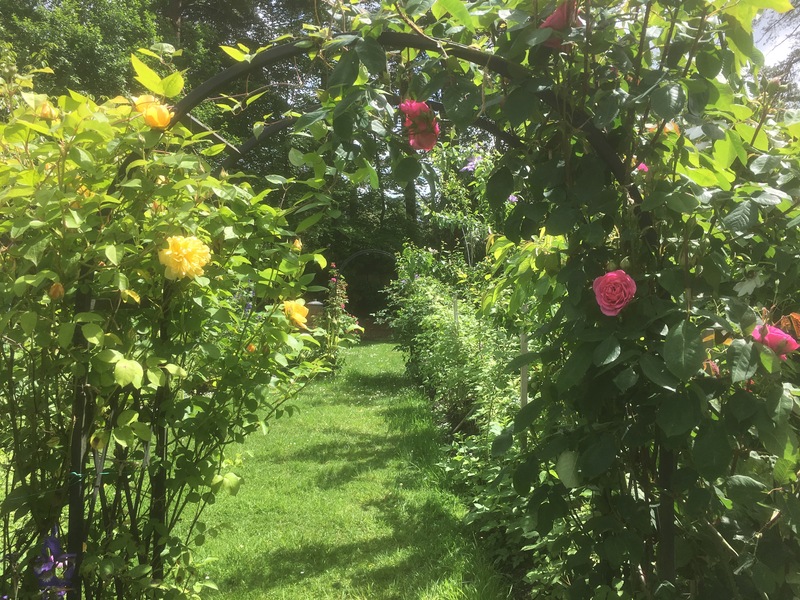 It’s actually very jarring to be walking down the garden surrounded by trees, shrubs, plants and flowers one moment, to suddenly walk beyond that out into a grassy expanse that’s not seen cultivation beyond mowing for many years. There is a hint of “something wrong” when looking beyond the second rose arch. The safety and comfort of the enclosing plants and flowers vanishes, replaced with a menacing dark. It can be quite atmospheric. A more revealing perspective is in the shot below, where I was stood a few feet off the legal garden boundary, right under the tall pines and the furthest distance from the house, looking back towards it. 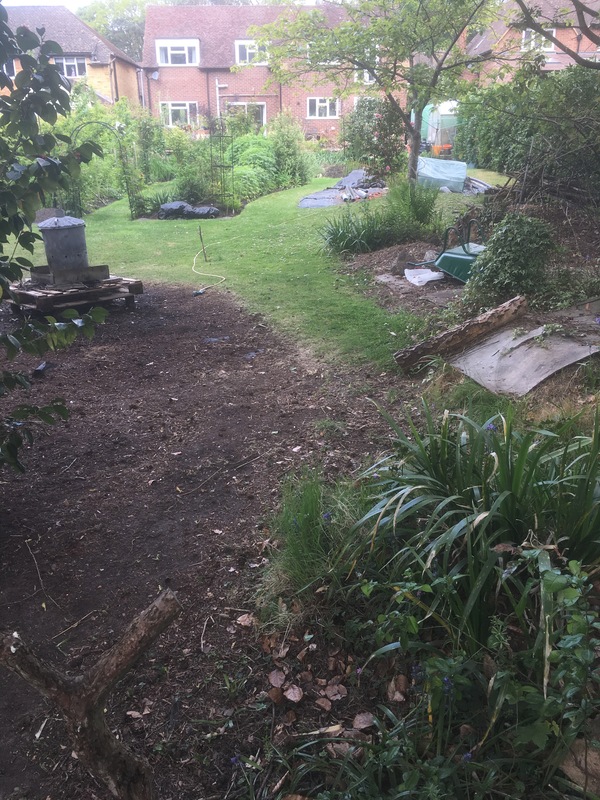 The scrub, grass and discard piles all too evident of the job yet to be done and then the “gardened” garden, a thriving cultivated oasis; then the distinct line between the two. The next phase of the garden restoration is to clear the rear half of the garden back to a blank canvas. This means tearing down a rotting shed, setting up a permanent compost heap, removing the discard piles one way or another and levelling out the ground. It also means removing a large stand of mature bamboo and all that entails. This last job alone might add on a season to the time it’s going to take. As the rear half of the garden reverts back to a blank canvas, my plans and ideas of what I want it to look and feel like are gradually coming into focus. The hardest part will be getting the front half and the back half to meet up happily, all the way up to and right along the current boundary line. Morning Sunil. Don’t do it too fast, or there will be no “big jobs” left! – and then you will want to move again to start a new canvas! Your Garden is enormous – I thought our 40 x 100 feet was big. Yesterday I finished the planting (for this year) of a new border. This one continues on from the yellow and white border and is mostly yellow and orange (with a dab of white and the same of red)….. this is because at the corner it turns left and becomes my “hot” border of reds and pinks. I will take some pics v. shortly. Hello Mrs Mac, it will be nice to get the hard work of clearing out the way so I can focus on making new borders and planting them up. There’s enough work left for many more years! That untamed portion of your property is just an opportunity for your to work your gardening magic. Enjoy! Thanks, Jason, I’m not looking forward to the work that’s going to be needed just to get it back to blank canvas to start with, before starting the process with the lawn edger, pegs and black polythene. It will be glorious when you’re done! I hope so Tammy, it will be some time before I’m done though!